For the 30th consecutive year, going back to 1987, the College of Education’s Secondary Social Science Education Program hosted the World Affairs Youth Seminar (WAYS), which brings high school students from several states to our campus. Once here, these students explore complex international issues, learn research techniques, and develop skills debating what they have learned while advocating for their assigned country’s position in a Model UN debate. 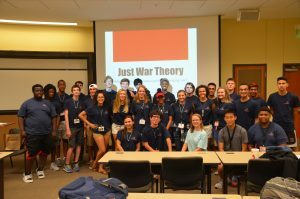 The seminar is the oldest educational outreach camp at Auburn University, and one of Auburn’s very few non-STEM related academic camps. We have written in the past about the camp’s history, its Model UN format, and the incisive ways these high school students grapple with complex issues going on in the world around them. What we have not done is examine how these students become so well informed about these issues, and how they are able to represent their assigned country’s perspective in these Model UN formats, where the going is frequently passionate, but always on point. One of these “excellent resources” is Matt Malczycki, Ph.D., who is the Department of History’s Middle Eastern historian. On the second full day of the camp Dr. Malczycki provided an overview of the causes of the civil war, and sorted out the many different stakeholders in the costly, bloody, and ultimately tragic conflict which has killed tens of thousands of innocent children and non-combatants. The refugee crisis resulting from the war may be even worse, having impacted several million people and caused a worldwide diaspora. Dr. Kohlmeier’s preservice social science teachers provide student-centered lessons each day on a specific topic such as: cyberattacks; rebuilding Syria’s infrastructure and political structure; and the effects of world hunger, particularly as it relates to this conflict. Of particular note in this year’s camp was a Day Three session led by Kohlmeier on the concept of “just war.” She began the interactive section by asking the students to think about what happens at their school when a fight breaks out. She asks if there are “rules” for such a fight or if anything goes. What is the role of bystanders, of friends, and of metaphorically (and literally) of hitting below the belt? Following the discussion, she broke the class into Cabinet-level groups who had to answer specific questions to advise the President of the United States on the principles of war. The groups were ranking possible solutions that led to lively debate about two key questions: (1) When is a nation justified in fighting a war? ; and (2) What actions are justified in fighting a war?